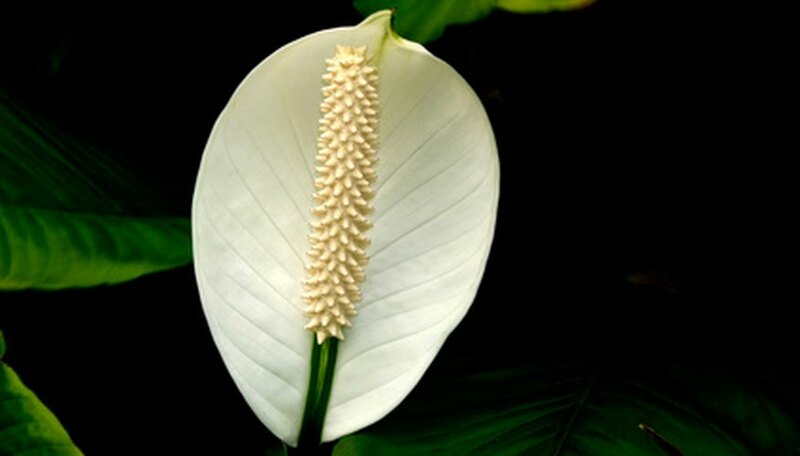 Peace lilies are among the top houseplants used to purify the air. According to the University of Minnesota Extension while all plants absorb carbon dioxide and release oxygen as part of the photosynthesis process, peace lilies also absorb airborne pollutants such as benzene, formaldehyde and trichloroethylene. Peace lilies are effectively remove benzene, a byproduct of inks, oils, paints, plastics, rubber, dyes, detergents, gasoline, pharmaceutical, tobacco smoke and synthetic fibers. In addition peace lilies absorb trichloroethylene, which are generally derived from metal degreasing and dry cleaning industries; also printing inks, paints, lacquers, varnishes and adhesives. Peace lilies are one of the few houseplants that will bloom in low interior lighting conditions. These houseplants are sturdy plants with glossy, dark green leaves. They periodically produce lightly scented flowers that look similar to calla lilies. Peace lilies prefer bright, filtered, light, but will tolerate low interior light. According to Clemson University Extension peace lilies will flourish in almost any type of potting mix. In addition peace lilies require little water and even less fertilizer, making them a low-maintenance plant. The soil should be allowed to dry out completely and only need fertilizer every two to three months. As a native plant to arid and dry regions of South and Central America the peace lily is accustomed to long periods of dry soil. If placed in direct sunlight this plant will likely burn. In addition, the peace lily does not like cold temperatures. Do not place in front of a drafty window or in a cold room.